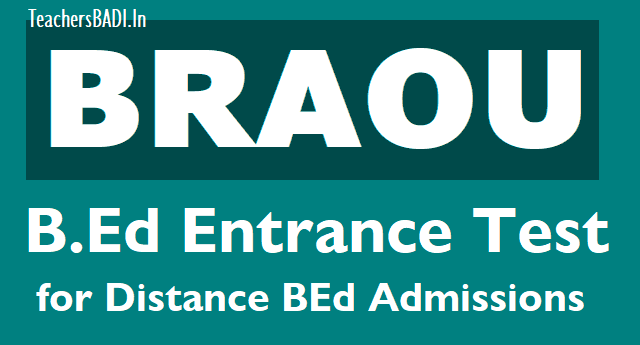 BRAOU Distance BEd Admissions 2019 /BRAOU BEd Entrance Test 2019 Notification/Ambedkar Open University BRAOU BEd Admissions 2019: Dr.B.R. Ambedkar Open University(BRAOU), the Department of Education is offering B.Ed. Programme, approved by NCTE (National Council for Teacher Education), from 2008 in Telugu medium. So, BRAOU, Department of Education will issue the B.Ed. Entrance Test 2019-2020 Notification in April and the University invites the online applications from the eligible candidates for admission into B.Ed. through Entrance Test. This notification Eligibility Criteria, Educational Qualifications, Age limit, How to apply, online application form, Last date for apply, registration fee, course fee, Exam date, Hall Tickets, Results and more details are provided here. Eligibility to appear for the B.Ed entrance exam: Candidate satisfying the following requirements shall be eligible to appear for the entrance test. (A) Teachers presently working (In-service) and have completed at least two years of experience as on 01-07-2019 on temporary / permanent basis in a primary, secondary / higher / senior secondary school recognised by the central or a state government or a union territory. (B) Candidate should have completed 21 years as on 01-07-2019. No upper age limit. The candidate has to register his/her candidature for appearing B.Ed. Entrance Test in University website www.braouonline.in and payment of registration fee through any AP ONLINE/TS ONLINE FRANCHISE CENTRE across the state on or before 30-01-2019.